Our journey started in 1972 when two Cornell University doctoral students studying under Dr. Urie Bronfenbrenner created the original AVANCE-Mother Infant Program in Dallas. 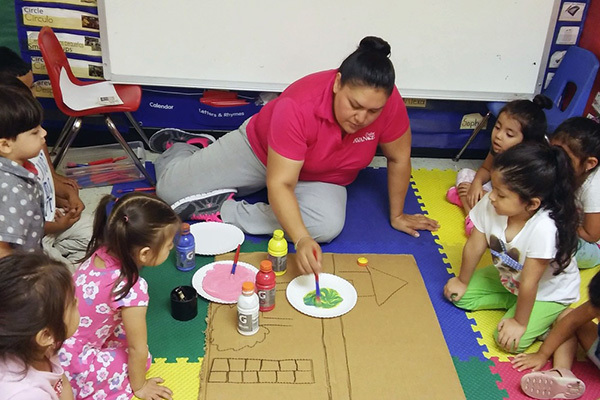 Then in 1973, AVANCE established the San Antonio office and began offering classes in the Marisol Housing Project. Since the program's inception, AVANCE has earned broad recognition and funding from various sources. Notable visits from national and international dignitaries include the Reverend Jesse Jackson, Prince Charles of Wales, Oprah Winfrey and former U.S. First Ladies Rosalynn Carter, Hillary Clinton, the late Barbara Bush, and Laura Bush. AVANCE has been featured in the New York Times, NBC’s Education Nation, ABC's World News Tonight and Good Morning America, along with several social documentaries such as Ounce of Prevention and Scared Silent. Other distinctions include Best Practices Award from the Texas Association of Parent Educators, HEB Excellence in Education Award, Simmons Luminary Award for Educational Excellence and many more. AVANCE could not function without generous support from a wide range of foundations, corporations, and individuals. We would like to thank the following organizations for their historic and ongoing commitment and generous contributions to help at-risk families develop a sound foundation for long-term success: A.L. Mailman Foundation, Bernard and Audre Rapoport Foundation, Bezos Family Foundation, Carnegie Foundation, Early Head Start-Child Care Partnership grant, Even Start Program grant, Ford Foundation, General Foods , Hasbro Foundation, Hilton Foundation, Mott Foundation, National Committee for the Prevention of Child Abuse and Neglect, Rockefeller Foundation, the United Way of Texas and the W.K. Kellogg Foundation. Featured in First Lady Hillary Rodham Clinton's book "It Takes a Village"
First Lady Rosalynn Carter cites AVANCE in her book, "Helping Someone with Mental Illness"
AVANCE President and CEO is featured on NBC’s Education Nation. AVANCE became a regular presence at NBC’s Education Nation and the White House Initiative on Early Education for Hispanics summits. Opened AVANCE’s first Parent-Family Community Engagement Center in Alamo, TX, serving the broader Rio Grande Valley Region. Invested heavily in updated AVANCE’s core courses with assistance from The Harvard Center on the Developing Child, Frontiers of Innovation, Child Trends, and True Point consulting. Established in 1973, AVANCE is a national, non-profit organization that meets hard to reach, low-income families where they are. We aim to liberate parents and their children from the cycle of poverty in a family-oriented, non-judgmental environment. ©2019 AVANCE, Inc. All Rights Reserved.